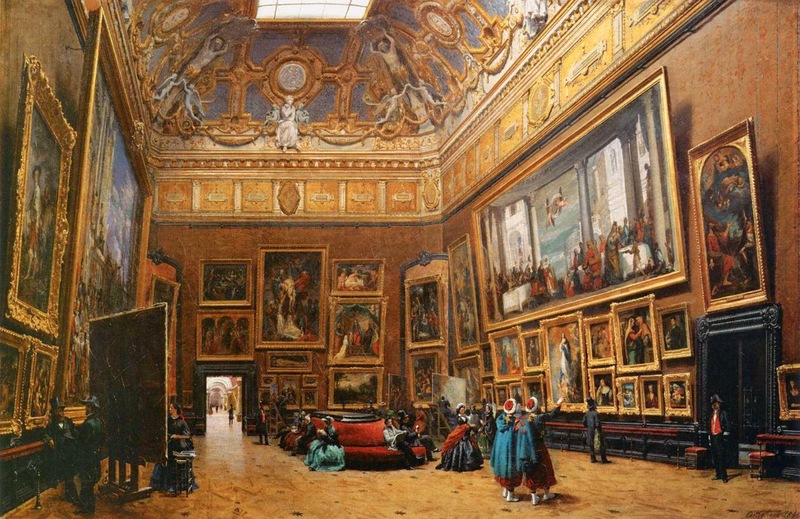 Giuseppe Castiglione, View of the Grand Salon Carré in the Louvre (detail). 1861, oil on canvas. Louvre. As more institutions begin to digitize their collections, you will notice the number of individual and aggregated databases increase as well as the quality of images and record details. Searchable database of more than 1,000,000 digital images and associated catalog data. ARTstor covers many time periods and cultures, and documents the fields of architecture, painting, sculpture, photography, decorative arts, and design, as well as many other forms of visual culture. Users can search, view and download images. Berg Fashion Library is the only resource to provide integrated text and image content on world dress and fashion throughout history. It includes the Berg Encyclopedia of World Dress and Fashion, an extensive E-Book collection, a vast image bank, extra reference resources and more. This resource is available remotely for free through New York Public Library but you must have an NYPL borrower card to access. Over 300,000 images from 2,000 sources and 30,000 artists with accompanying metadata. Users are able to search all media including photography, fine art, engravings, sculpture, architecture, archaeology & ethnography, history, science & medicine, decorative arts and artifacts. Oxford Art online gives users access to more than 40,000 image links and 5,500 images contained within Grove Art Online, as well as access to more than 5,000 entries and 500 images from the Oxford Companion to Western Art, the Concise Dictionary of Art Terms, and Oxford’s Encyclopedia of Aesthetics. Smithsonian American Art Museum maintains a number of specialized art databases and photographic archive collections which include: Art Inventories, Inventories of American Painting & Sculpture reference over 400,000 works in public and private collections nationwide, and include records from Save Outdoor Sculpture! ; and Photograph Archives Catalog, containing records of the Peter A. Juley & Son Collection (127,000 photographic negatives) and the American Sculpture Photograph Study Collection (2,600 photographic prints). The Smithsonian Archives of American Art is continually being updated and currently over 16 million items are in the database. The Archives aims to preserve their collection of papers and primary records of the visual arts in America and make it available to the public. While you can search their enormous collections in full, their Image Collection alone contains over 8,000 photographs, letters, sketches, and diaries. NYPL has over 300,000 images intheir Picture Collection. These digitized images are from prints, photographs, books, postcards, newspapers and magazines. The images are from NYPL holdings and are mostly dated before 1923. Connecticut College owns a large collection of art work that includes American Art before 1945, American Art after 1945, European Art before 1945, African Art, Asian Art and a large collection of prints from Rembrandt to Dürer. This collection of images is based on six collections: American Institute of Indian Studies which includes over 125,000 photographs of sculpture, terracotta, painting, architecture and numismatics; Government College of Arts and Crafts from the Museum of Contemporary Art(Chennai) is a collection of photographs dated from the mid-1800s; Oriental and India Office Collections is currently being prepared for the database; Keagle Photograph Library, The Hensley Photo Collection and The Bond Photograph Library all three contain WWII photographs taken by an American servicemen. The Smithsonian American Art Museum is one of the world’s largest and most comprehensive collections of American art. Major areas of the collection include: The American Colonies and the Early Republic; Nineteenth-Century Art: Western Art, Impressionism; Twentieth-Century Art: Realism and Abstraction; Contemporary Art and Media Arts; Sculpture; Works on Paper: Prints, Drawings, and Photographs; Folk Art, African American Art, and Latino Art and Contemporary Craft and Decorative Arts. The Kyoto National Museum Online Database covers over 10,000 images from the museum collection. The Search the Collections database is growing and currently has 16,459 images records. You can limit your search to only records that contain an image. The Herbert F. Johnson Museum of art is considered one of the finest university collections in the United States. The university has a comprehensive collection of art including American Art, Decorative Arts and Modern & Contemporary art. The collection database offers several search and browse features, but the quickest way to search is to click the Advanced Search function in the upper right corner of the webpage. This site enables visitors to browse and download jpegs of large format digital files created through project supported by The National Endowment for the Humanities and The Henry Luce Foundation. Future online collections include related photoarchive images and documentation, book materials, Frick Collection images, and archival documents. There is also a guided advanced search feature allows you to find artwork by artist, title, or subject, or by certain attributes such as style, genre, theme, or date. The Metropolitan Museum has recently updated their website and their image database interface as well. You can currently search 343,190 items in their collection database, and the number is growing as more items are digitized. You can also save images into your own gallery to reference later. The MoMA features an online database of their collection that is easy to search and browse. Their database currently has 6,962 Artists and 39,106 Works online. The National Gallery in DC has an enormous collection database which features images of artworks in two sizes, details about the creator(s), dates and information about individual pieces on many works. The search is easy to perform and can be limited by artist's last name, key words in the title, school, style, date, medium, and/or short list of popular subjects. This database covers artworks from the Tate Britain, Tate Modern, Tate Liverpool and Tat St. Ives collections. Images can be selected and saved, viewed in a light box and a caption about the pieces is included for any artworks that have been on display. The Victoria & Albert has recently had a website overhaul, and the new interface is intuitive and simple to use. Their image database, Search the Collections, is a work in progress with over a million records to search. As they add information each record will contain more detail so not all records will have the same amount of information. The Yale University Galleries Collection Database allows you to explore their large collection of art that includes: American Decorative Arts, American Painting & Sculpture and Modern and Contemporary Art. This is a brand new (and free!) image database that with a very user friendly interface that is easy to search and browse. Although the project is large and has just started, Wikipaintings will cover the history of art including contemporary works and artists and currently features over 58,600 historical and contemporary artworks. The works are free to use for educational purposes and the database contains both copyrighted and public domain images of artworks. This database allows users to search European painting and sculpture from 1000-1850. The database has over 27.600 reproductions as of August 2011 and is continually updated. This database also features a mobile version. The Getty Research Institute is digitizing selected materials from their collection, which are free to view and download from their Digital Collection Database. This database has over 100,000 images and a great advanced search feature. This online collection of over 11,000 maps, focuses on rare18th and 19th century cartographic materials on North and South America. Historic maps of Europe, Asia and Africa are also represented. Extending from prehistory to the present day, the timeline is, “ a chronological, geographical, and thematic exploration of the history of art from around the world, as illustrated especially by the Metropolitan Museum of Art's collection.” The timeline includes subject and artist indexes, as well as a search function. It also includes maps, and lists key events in history. High quality images can be enlarged for close scrutiny. SPIRO is the visual online public access catalog to the 35mm slide collection of the Architecture Visual Resources Library (AVRL) at the University of California at Berkeley. The collection numbers over 250,000 slides and 20,000 photographs. SPIRO content is the responsibility of AVRL, while programming and system support is provided by UC Berkeley's Museum Informatics Project (MIP). SPIRO was named in honor of the late architectural historian Professor Emeritus Spiro Kostof, and stands for "Slide and Photograph Image Retrieval Online. SPIRO is freely available on the World Wide Web. Art historical databases (ahdb) is a not for profit organisation aiming to provide art and history related online resources that are free to access and presented in a manner relevant to both academia and the interested public. This site’s mission is “to become the definitive and most effective guide to museum-quality fine art on the Internet.” It currently represents the work of over 8,000 artists with over 150,000 images. The pictures in this directory are from the calendar section of the Tres Riches Heures. This was painted some time between 1412 and 1416 and is arguably the most beautiful part of the manuscript; it is certainly the best known, being one of the great art treasures of France. In terms of historical and cultural importance, it is certainly equal to more famous works such as the Mona Lisa, marking the pinnacle of the art of manuscript illumination. This Library of Congress exhibit presents some 200 of the Vatican Library's most precious manuscripts, books, and maps--many of which played a key role in the humanist recovery of the classical heritage of Greece and Rome. This free multi-media database, based at the University of Oxford, offers open-source, high quality images of archaeological sites, with buildings and art, covering the areas of the former Roman empire which later came under Islamic rule, such as Syro-Palestine/the Levant, Arabia, Egypt, North Africa and Spain.